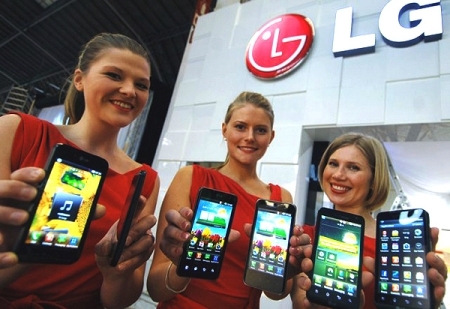 LG is planning to release at least seven new smart-phones based on the Android OS and Windows before this year end. Out of 7 models, Prada K2, Univa, Victor, Gelato NFC, E2, and K will be running Android where as LG Fantasy will be running Windows Phone 7 Mango. LG Prada K2 will have the shell thickness of 8.8 mm and a 4.3-inch touchscreen. It will be equipped with Nova, dual-core processor, 8 megapixels rear camera, a 1.3-megapixel front camera and 16 GB of internal memory. LG Univa smartphone will be 11.9 mm thick and will have 800-MHz processor, 3.5-inch touchscreen with 480 × 320 pixels, 5 megapixel camera module and Wi-Fi. LG Victor phone will have a 3.8-inch OLED-display with 800 × 480 pixels, a processor with 1 GHz, two cameras (with 5 and 0.3 megapixel) and Wi- Fi 802.11b/g/n. LG Gelato NFC will be equipped with NFC chip, 800 MHz processor, 3.2-inch display with 480 × 320 pixels and the camera with 3 megapixels. LG E2 will be endowed with a processor of 1 GHz frequency, QVGA-screen and 3 megapixel camera. LG K will have a 4.5 inch screen and retina display of 720P where as LG Fantasy will be LG's first Windows Phone 7 Mango based device.